The flavour of this Limoncello Cake takes you back to your favorite holiday destination! 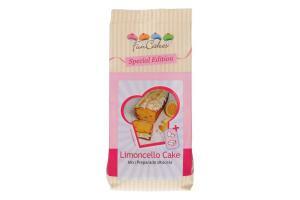 This FunCakes mix contains fruit pieces and crispy pearl sugar to bake a delicious lemon flavoured cake. The Special Edition mix is easy to prepare, you only have to add butter and eggs. The FunCakes Special Edition mixes are a range of new and seasonal baking mixes with a temporary character. Preparation: Preheat the oven to 170°C (convection oven 150°C). Ingredients need to be at room temperature. Mix 175 g of (cream) butter soft. Add 400 g of the mix with 4 eggs (200 g) and mix on low speed for 4 minutes to a smooth batter. Grease a baking pan of approx. 25 cm (10”) long. Pour the batter into the pan and bake the cake in the centre of the oven for approx. 55 minutes until golden. Release the cake immediately after baking and let it cool down on a cake grid. Ingredients: sugar (50%), wheat flour, lemon juice (concentrate, 1%), apple (1%), raising agent: E450, E500, fructose syrup, natural flavouring (citrus), emulsifier: E472b (palm, rapeseed), E477 (palm), salt, glucose syrup (dried), milk powder (skimmed), rice flour, flavouring (contains 0,2% alcohol), thickener: E415, E440, vegetable oil and fat (palm). For allergens, see ingredients in bold. May contain traces of: egg, soy and lupin. Eine Nachricht bei Änderungen zu FUNCAKES MIX FOR LIMONCELLO CAKE 400G versenden.